Silver 'Valkyrie' type pendant. Cast in the form of a human figure, possibly male rather than female, standing to the left (height 40mm), holding a circular shield under the left arm and an upright, fullered sword with a short, straight guard in the right hand, as the usual symbol of a warrior. The figure wears a long dress-like tunic; the beardless face is shown in profile, with a single incised oval eye and short hair under what may be a hood. The shield is shown, unusually, from the back, the figure's hand grasping the shield-grip. The back of the shield is decorated with four radiating incised motifs, possibly animal legs, and the rim is marked with a circle of punched dots. Black niello survives in the incised lines. On the reverse there is a single pierced lug. The object may be compared with a series of similar early Viking-period, usually female figurines of the 9th century from Scandinavia and England. 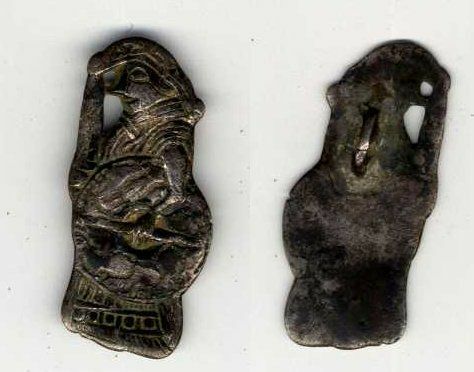 Parallels suggest that the pendant is an Anglo-Scandinavian product, and a reflection of the main Danish settlement in East Anglia after around 879 and can be dated to about this time. Further discussion and details of parallels can be found in the Treasure Annual Report for 2002, no. 43.